A Sub–Zero ice maker is a device that many people take for granted, that is, until there is a problem. 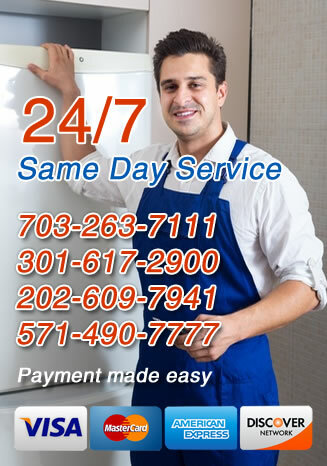 If your Sub–Zero ice machine starts to leak, stops producing ice, or starts producing small or dirty ice, you need a professional to take a look right away.For Sub–Zero ice maker repair in the greater Washington D.C. area, call All Time Services. We’ve been providing expert ice machine repair across the region for years and we can get your system back on track quickly. A good ice maker should work consistently whenever you need it and because the device isn’t needed constantly, that means it has multiple mechanisms in place to create, hold and dispose of ice. So, if a single part of the system breaks, it is very likely that your ice machine may need to be repaired or in some cases replaced. What should you look for in particular? The first sign of a problem with your Sub–Zero ice maker is a leak. If water is leaking down from your refrigerator, on the outside in particular, it might indicate problems with your ice maker. Another common ice machine problem is small or oddly shaped ice cubes. If you’re used to one inch cubes of ice and you’re suddenly getting shavings or small chunks of ice that are stuck together or deformed, there may be a problem in the cooling unit. Another problem to watch for that you will almost assuredly notice right away is dirty ice. Whether it is small specks from the machinery or something much worse from your pipes, foreign contaminants in your ice are a sure sign that you need professional service on your Sub–Zero ice machine. Far too often, people ignore the little signs, allowing them to develop in to more serious issues. Dripping, tiny ice cubes, odd defrost cycles and other problems that shouldn’t be there are all sure signs that there is a problem with your Sub–Zero ice machine. If they occur or if you suspect a different problem, call All Time Services as soon as possible. 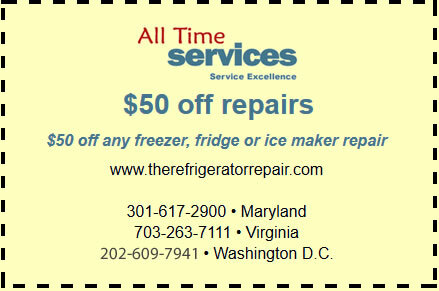 In Arlington, VA, Gaithersburg, MD and the surrounding areas, we are the most trusted refrigerator and ice maker repair company. No matter what type of problem you’re having with your Sub–Zero ice machine, our expert technicians are standing by, ready to help.